NIA CHARLESTOWN NEVIS (August 28, 2014) — Teachers on Nevis who assisted students in their preparation for local and external examinations last year, were lauded for their efforts by Premier of Nevis and Minister of Education Hon. Vance Amory as he gave an overall view of the recently released Caribbean Examinations Council’s (CXC) results. “I want to generally congratulate all of you teachers who were involved last year in the preparation of our children for their external examinations and all their examinations, Test of Standards and so on. “I know that you have had your commendations during the graduation exercises and today I want to just generally speak… about the external examinations which is the CAPE and to say to you what the results are in terms of percentages,” he said. According to Mr. Amory, all the secondary schools on Nevis had recorded increases in their pass rate. “CAPE Unit 1, for [Nevis] Sixth Form, we have a 78 percent pass rate and for Unit 2 we have an 84 percent pass rate,” he said. 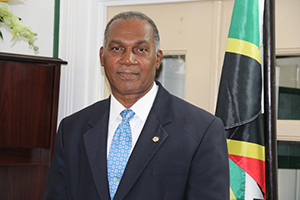 With regard to the Caribbean Secondary Education Certificate (CSEC) examination results, Mr. Amory disclosed that area had also seen an increase in the pass rate. “At Charlestown Secondary School, the pass rate was 77 percent, an increase of one percent over last year. The Gingerland Secondary School shows a pass rate percentage of 80 percent, a five percent increase over last year. Then we have the Lyn Jeffers School (Nevis International Secondary School) with a 78 percent pass rate this year, with a 16 percent increase over last year,” he said. However, Mr. Amory noted that he planned on providing a more in-depth report on the results and single out students and their accomplishments. “I will make a much bigger address in terms of looking at which students have done well what are the pass rates in some of the individual subjects just to give you that synopsis of where we are,” he said.